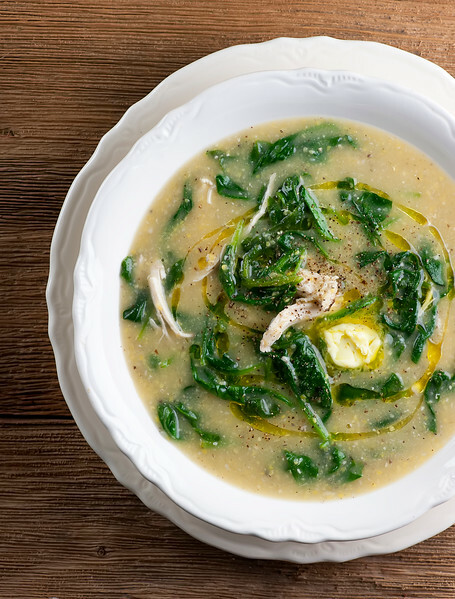 Creamy polenta is the basis for this hearty parmesan and spinach-filled chicken soup. Once you try parmesan polenta chicken soup you may never go back to regular chicken noodle soup again! This soup is reason number 1,284,735 that I always make extra chicken when I am making chicken for other reasons, because leftover chicken means you can make things like this creamy, dreamy parmesan polenta chicken soup in a snap. If you have ever had a bowl of warm and wonderful polenta, just imagine it in soup form with chicken and baby spinach swirled into it, and a drizzle of olive oil on top. And if you haven’t ever had a bowl of polenta…well, you have a great treat to look forward to, because polenta is Comfort Food Extraordinaire. Ready for warm and wonderful soup deliciousness? Let’s make it!You start off with some chicken broth (as always, I like the Imagine brand) and some fine-ground yellow cornmeal. Polenta is cornmeal that has been simmered in liquid until it is soft and creamy, like a porridge. The Southern husband refers to polenta as grits, and I usually let him (because marital harmony and all that), but grits are made from a whole different type of cornmeal. One way or the other, I get my cornmeal of all kinds from Anson Mills, because they have the best cornmeal on the Planet Earth. You heard it here first. Anyway, you want to bring your broth to a simmer, and then pour the cornmeal into the simmering broth in a slow steady stream, whisking all the while. I find this easiest to do with my trusty Pyrex measuring cup. Once the cornmeal is in the broth, let it simmer away for about 10 minutes, at which point you should have a nice, slightly thick soup on your hands. 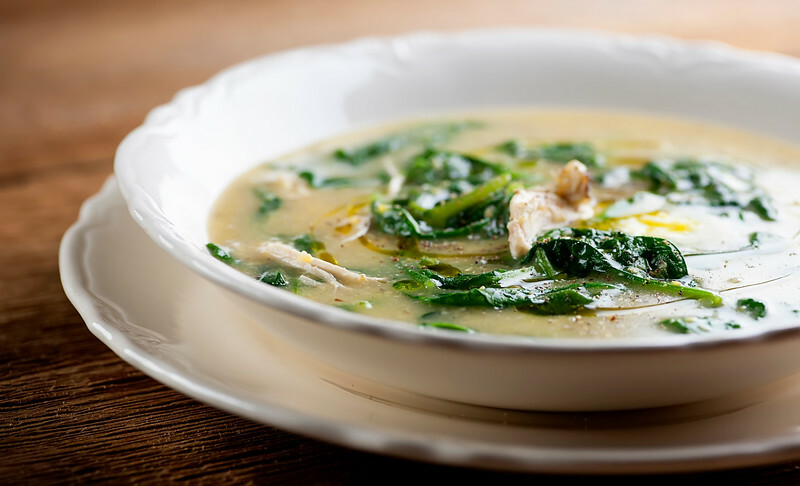 Now stir in some shredded Parmesan cheese, followed by some baby spinach and some of that leftover cooked and shredded chicken, and let it simmer on until the spinach is wilted and the chicken is heated through. Season it up to your taste with salt and pepper. Now comes my favorite part. Ladle it into bowls and drizzle it with olive oil…and then put a little dollop of soft butter on top. The butter part is optional, but I am here to tell you that butter and polenta of any kind are a match made in heaven, so I highly, highly recommend this final step. Make sure you get chicken and spinach and a little bit of that butter all in the first glorious spoonful. Feel very very happy. Bring the chicken broth to a simmer in a large deep saucepan. Pour the cornmeal into the broth in a slow steady stream, whisking constantly. Simmer over medium heat for about 10 minutes or until the soup is slightly thickened. Whisk in cheese and simmer for one more minute. Stir in spinach and chicken and simmer for another 3-5 minutes until spinach is wilted and chicken is heated through. Season to taste with salt and pepper and ladle into bowls. Drizzle with olive oil. GORGEOUS! I love polenta…..so much, but never had like this before and leftover chicken makes me happy ’cause I get to make other stuff with it. Those soup looks SO satisfying!! Gotta try this one :) Like comfort in a bowl. Pinned! Thanks for the pin, my friend! Save me a bowl Kate! This looks amazing! Looks so easy too. Just the way I like it! some people garnish everything with a swirl of olive oil, but butter is my way to go! what a great soup idea–it’s one i haven’t seen before! Kate!!! this dish looks amazing! I love polenta and I am surely making this dish! Polenta of all kinds is the best, right? I’ve had an lonely container of cornmeal in my cupboard practically screaming to be used so this is perfect n looks delicious .. n my husband puts oliveoil on everything so this is a winWin for many reasons. Going to make it!